Screen capture of the feature on Sportdiver.com – live link is below. My July feature has just been published in Sport Diver Magazine – it’s all about the dirty, but bodacious, muck diving in Ambon Harbour, in Indonesia. In addition to the essay, there are 15 images, with descriptive captions, at the top of the page (controls on top right of image). They tell a story of some of the really weird, wild and wonderful stuff that can be found in this remote corner of the planet. 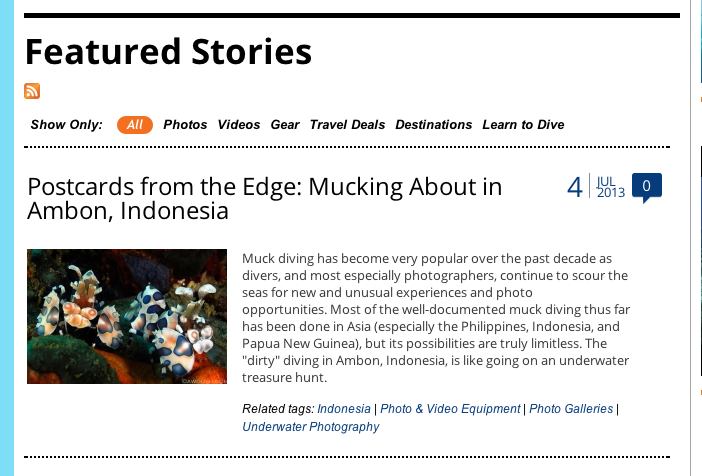 This entry was posted in All About Scuba Diving, Indonesia Travel, Photography, Sport Diver Magazine Photo Essays, Writings and tagged Ambon, Indonesia muck diving, Muck Diving, Sport Diver Magazine Features. Bookmark the permalink. Hello,I will be in Ambon in March. Can I ask you a couple of questions?